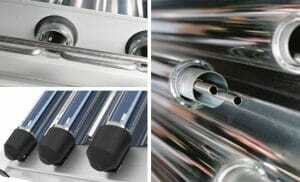 Ritter evacuated tube collectors are industrial products manufactured in large series in Germany. They feature outstanding design, professional workmanship, high quality and high energy yield as well as an attractive price/performance ratio. The use of high-quality, corrosion-resistant materials which are tried and tested ensures smooth and trouble-free operation over a long service life. The well-known sturdy nature of the Ritter tube has been confirmed by positive hail resistance tests in accordance with ISO 9806 and thermal shock tests. In order to improve efficiency, a high-reflecting, weather-resistant CPC (Compound Parabolic Concentrator) reflector is installed behind the evacuated tubes. 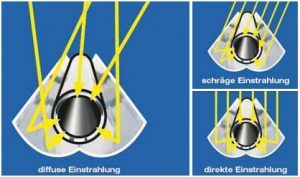 The specially designed geometry of the reflector, which has been optimized by Ritter, ensures that direct and diffuse sunlight reaches the collector absorber even with unfavourable incidence angles. This significantly improves energy yield. The performance and geometry of the evacuated tube have been optimized. Each evacuated tube consists of two concentric glass tubes closed by hemispheres at one end and fused together at the other end. The space between the tubes is evacuated and then hermetically sealed (vacuum insulation). 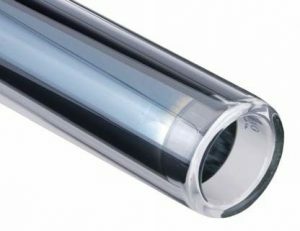 To make solar energy usable, the outer surface of the inner glass tube is coated with an environmentally compatible, highly selective absorber layer. This coating is therefore in a protected position in the evacuated space. The highly selective absorber layer features very low emission and very good absorption. 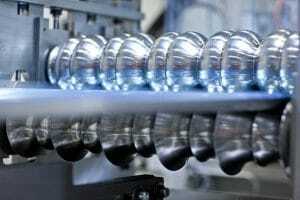 For the development of the collectors, Ritter’s many years of CPC experience were combined with the latest developments in production technology. Sharp reflector edges are surrounded at the side by an aluminium section frame. The ends of the aluminium sections forming the collector frame are sealed with rubber components. The number of screws used at mounting points required for maintenance has been minimized. Rivets are not used at all. On the CPC OEM / INOX, CPC XL INOX and OEM 21, the flow and return pipes can be connected to the left or right of the manifold. Depending on the positioning of the flow connection, the sensor is installed on the left or right. The pipe registers are manufactured in an industrial process which minimizes the number of soldering points. As a result, the system is extremely well-protected against leakage and internal scale formation is minimized. The low specific content per unit area ensures the low heat capacity required. The reflector is manufactured from metal sheet with protective coating using high-precision roll forming technology. 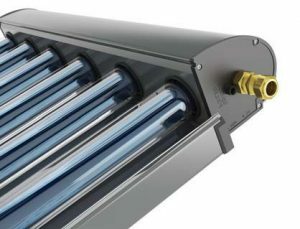 A special mounting system ensures that the CPC reflector of Ritter evacuated tube collectors can be replaced without tools when the need arises. The heat conduction plates are made from aluminium which is not adversely affected even at high stagnation temperatures. The heat conduction plate is hemmed into the two register pipes. When the need arises, the pipe holders can be removed from or installed on the mounting rail without using tools. Sharp ends are closed with rubber sections.